When I was little the items of doll clothes I lost the most were socks and shoes. I never seemed to be able to keep them with the rest of the clothes. Of course, some little girls don’t care much for putting socks and shoes on their dolls. But I’ve always had a love for shoes so it annoyed me to lose them. Well, despite whether she loses them or not, crochet these for a little girl and see if she doesn’t think you’re the best! If you have any questions ask me in the comments below and I’ll get back to you as soon as possible! This entry was posted on Thursday, September 12th, 2013 at 12:00 AM by Amy	and is filed under Free Crochet Patterns. You can follow any responses to this entry through the RSS 2.0 feed. You can skip to the end and leave a response. Pinging is currently not allowed. These are terrific! I’m going to use these as a sample bootie in our crochet booth at the Crafts Shows this fall! These are perfect ! So easy / fast / cute . Thank you so much for sharing ! 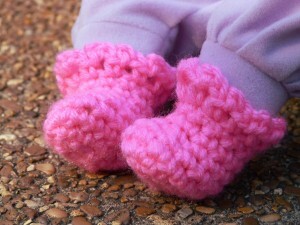 would it be possible to get this pink baby doll booties in a larger size? the AG doll foot measure’s almost 2 1/2 in. I’m new trying to do these and don’t know how to increase the pattern to that size. Need help. Thank you. You could try using a thicker yarn and a larger hook, e.g. 6mm. This would make them bigger and you could stick with the simple pattern. Enlarging the booties should be pretty simple. You need to start with adding chs to the beginning ch-5. Just how many will be difficult to say; you will need to experiment. Continue the pattern in the same manner (with increases at both ends and single sc on the sides. When you decrease, simple add the extra sts to the pattern, keeping the decrease sts the same. I hope this helps you. If not let me know and I’ll see what else I can do. It doesn’t say how to chain at the beginning of your pattern. The pattern starts out with, “ch 5.” What are you having trouble with exactly?